Audi took around half a decade to bring the sporty version of the 2008 Q5 crossover but for the SQ5 they didn’t made any delay. At the Frankfurt Motor Show 2015 company shared its all new Audi SQ5 TDI Plus 2016. Housed with lots of power and sporty looks, the model offers great mpg figures. 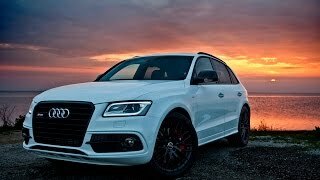 Let us have a look at the review of Audi SQ5 TDI Plus 2016 to know more about it. Talking about the interior of Audi SQ5 TDI Plus 2016, I would say company has added some extra blends to the already fantastic interior of base version. The seats of the model come wrapped in Nappa leather featuring diamond pattern in silver paint over them while the door armrests gets the essence of leather. The rear seats come with the sliding feature this offering you some extra space for your luggage. Apart from these rest everything gets carried from the standard model, like the three-spoke flat bottom steering wheel and the center console and dashboard which still has the aluminum inserts and yes not to be forgotten the instrument cluster too. However company offers you additional Macaw Blue Package with which you can add some extra sportive essence by including sports seats, new steering wheel, gear lever and the floor mats. Thus rounding up the interior details of Audi SQ5 TDI Plus 2016 I would say it adds the sportive blend to the already luxurious arena. The exterior of Audi SQ5 TDI Plus 2016 doesn’t has enough changes in it. However to make it look distinct company has added some sportive inclusions that make it look distinct. The changes include a roof spoiler, new door handles, mirror caps and rear diffuser. Taking a lap ahead the model now rolls over five-twin-spoke massive 21” wheels. You can notice the red brake calipers sneaking through them. At the rear end are the four exhaust pipes interconnected through two clasps while the option to have Audi Exclusive Macaw Blue special equipment package undoubtedly will add more of bold and sportive features to the exterior of Audi SQ5 TDI Plus 2016. 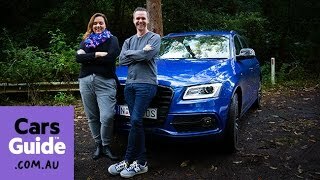 Beneath the hood of Audi SQ5 TDI Plus 2016 is a powerful 3.0 liter V6 engine cranking total output of 340 hp and peak torque of 700 nm mated to eight-speed Tiptronic gearbox. 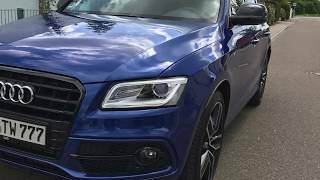 With this power rolling the model the top speed of Audi SQ5 TDI Plus 2016 touches the mark of 155 mph while the 0-62 mph sprint can be knocked in just 5.1 seconds.